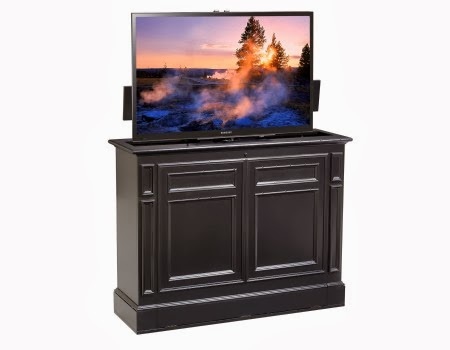 Here at TV Lift Cabinet, we’re always trying out new things when it comes to color and design we’d like to use this space this week to bring your attention to a few new highlights in our catalog. The Chatham lift is available in black, brown, and white color schemes and features a 360 degree electric swivel cabinet. This cabinet is 100% wired and represents a great example of integrated component storage for your electronics. The classic styling looks great from any angle: at the foot of your bed, against the wall or free standing. Your remote control will even work through the cabinet with all components enclosed as a result of the built-in IR receiver. It even has a built in power receptacle. 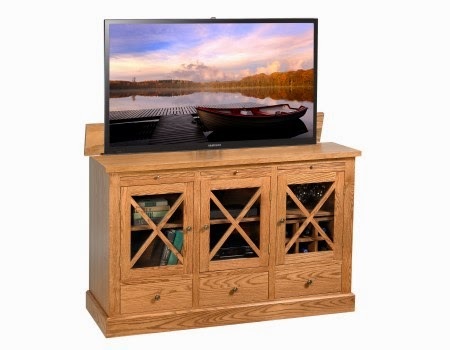 The Homestead cabinet is now available in a light brown oak as well as a medium oak finish. This cabinet has a more rustic look and would be at home in a cozy, old-fashioned den. features of a modern piece of furniture as well. It can be scaled to hold a 60” flat screen above the three cabinet doors and drawers with pull-out shelves. It even has a removable wine rack. Our Sanctuary TV lift cabinet is available in black, brown, and espresso finishes and is designed with a sleek, modern look in mind. With two large paneled doors, this cabinet demonstrates smooth, crisp lines that look at home in any living room, den or, or guest room. One of the three colors will fit in with just about any décor theme. 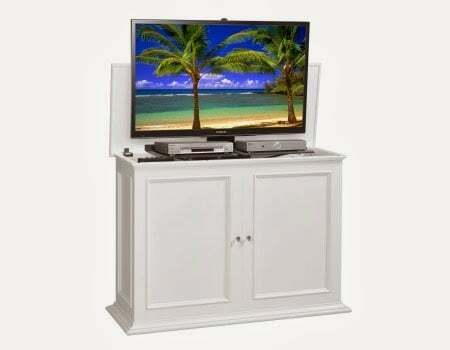 Inside this minimalist cabinet, all of the features you’ve come to expect from TV Lift Cabinets are concealed, including cable management, a power receptacle for the TV, and outboard manual controls and surge protection.